Today: Sunshine, highs near 80. Wind from southwest 15-20 mph. Overnight: Mostly clear, big bright harvest moon. Lows near 60. Tomorrow: Sunshine mixing with clouds, a thunderstorm north and west. High in the low 80s. 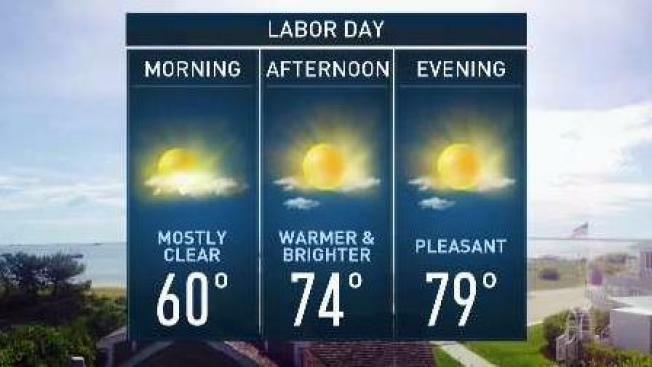 Sunshine will be widespread on Monday with low humidity and highs around 80. Tuesday turns muggy and windy as highs again reach the 80s. An approaching cold front will trigger a few showers, downpours, or thunderstorms north and west of Boston, especially during the afternoon. That same front will then slow down and crawls through New England during the mid-week timeframe. That means more periodic rain on both Wednesday and Thursday. If we’re lucky we’ll push the front and rain offshore just in time for the Patriots opener, but it will be close. Late week all eyes turn south, where Hurricane Irma will be nearing the Bahamas. With a large area of high pressure sitting in the middle of the Atlantic, and a dip in the jet stream over the East Coast, the storm will either move toward landfall along the East Coast, or be swept out to sea. At this early juncture an East Coast landfall of some kind would be favored, but it’s still too early to know much more than that.